Sweet onions, tangy goat cheese and a light egg custard make a savory tart perfect for a summer lunch or appetizer. The caramelized onions with thyme and goat cheese are a magical combination. 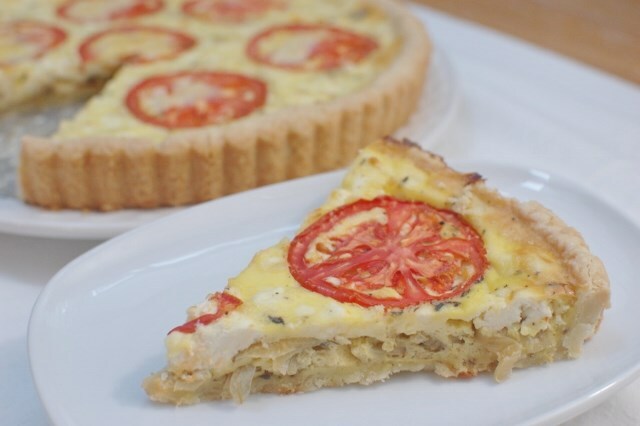 If you have an heirloom tomato this time of year, it will make the tart extra lovely. A tart pan with a removable rim is best so the tart can be removed from the pan. However a pie dish will work in a pinch, just leave it in the dish and it will be more like a quiche. I like this Anolon tart pan, because it’s non-stick with cool-touch silicon grips. The pan is available at housewares retailers or on line at www.potsandpans.com for about $20. Preheat oven to 400°F. Roll dough to a 12-inch circle. Press into a 10-inch tart pan with removable sides, folding dough in a double layer around edge. Line dough with parchment paper and fill with uncooked rice or beans. Bake 10-12 minutes. Remove paper and weights and continue baking about 5 minutes until lightly browned, pricking any air bubbles to release steam. Cool. (See note). Reduce oven to 350°F. In a large skillet cook onions with butter, 1/4 teaspoon salt and thyme over medium-low heat until very soft and browned, about 20 minutes stirring occasionally. Whisk eggs and flour until smooth. Stir in milk, 1/4 teaspoon salt and pepper. Place tart on a baking sheet (to catch any spills). Spread onions and goat cheese evenly on crust. Pour egg mixture over. Arrange tomato slices on top. Bake at 350°F for 45 minutes or until custard is set and top is very lightly browned. Let stand 10 minutes. Remove pan rim and cut into wedges to serve. Make Rosie’s Short-Cut Pie Crust or use Trader Joe’s frozen pie dough which is very good. If you’re in a hurry you can skip pre-baking the crust but it will be a little soft. Recipe and photo by Rosemary Mark for Anolon Cookware. Love the Thai rice salad. I’ve made it at least four times since you published it. It is great, easy to make and nice with chicken satay skewers on a picnic. Looking forward to trying the goat cheese tart. Still making your frittata recipe. wow Francine, that sounds like a record that you’ve made the Thai Salad so many times! And the frittata too. Thank you so much for letting us know, and hope you like the tart too! Love hearing how recipes work out. This sounds delish! Of course anything with goat cheese is delicious to me. Will definitely make it. I’m in the goat cheese camp too! I made this last night. The family loved it! Would definitely make it again. I usually make my own crust but did try the Trader Joes frozen crust. I would not use it again as it was too sweet for this quiche. It also required thawing overnight in the refrigerator before using. Since I didn’t read the box, I ended up trying to use it before fulling thawing it. It cracked like mad, of course, and I had to roll the whole thing put. Would have been easier to make my own. It did look lovely and was very tasty. Thanks, Rosemary. Francine — I know EXACTLY what that’s like working with the frozen crust — I will add that note about thawing because the same thing has happened to me. And I too said I should have made my own crust! Agree it is sweet for the tart, some of my tasters liked that. Thank you so much for reporting on your ‘results’! Oh my gosh! I missed this one! I love the flavor combination of the goat cheese and tomatoes. And the caramelized onions are a wonderful addition. Can’t beat caramelized onions — the cheese and tomatoes are the ‘icing’!